Hawick Waverley manager Mickey Hope says survival is the aim for the remainder of the season after being dumped out of the Beveridge Cup. 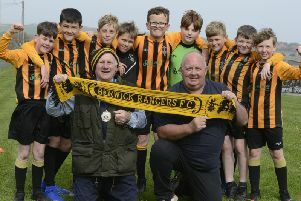 Hope’s depleted side were well beaten by Division A title hopefuls Gordon in the cup competition at windy Stewart Park. Focus now turns to the league, with Waverley only having a two point advantage on ninth placed Greenlaw. Hope said: “We need to stay in the league and I am confident we can do it, provided we get back our experienced players. “We had four experienced midfielders missing against Gordon who would have loved the battle. “It has been really difficult keeping the players interested in last few months due to the lack of games, and our fitness has also suffered as could be seen at the end of the game. Hawick’s lack of midfield personnel meant Hope’s 15 year old son Charlie made his second appearance of the season. But he and his team-mates found it tough against a Gordon side aiming for a quadruple of trophies this season. After Nigel Burrows and Greg Porter hit the woodwork, Gordon finally found the net on 34 minutes as Kevin Utterson smashed the ball in after Kerr Brown made a good stop to deny Graeme Gillie. And it was 2-0 on 40 minutes as Jamie Milner’s perfect cross gave Utterson the chance to claim his 17th goal of the season with a diving header. Just as it appeared the tie was over, Waverley struck back in first half injury time in controversial circumstances. Gordon were adamant two Hawick players were offside, only for referee Keith Wallace to allow play to continue, and Jordan Yardley managed to squeeze his shot under Elliot Turnbull. The goal ensured the second half was more of a contest, as Waverley had plenty possession without creating too many chances. But Gordon still had the greater cutting edge, with Craig Livingstone hitting the bar and Ross Cairns clearing the rebound off his own line. Gordon finally restored their two goal lead with 12 minutes left with the best goal of the game. A nice passing move saw Livingstone set up the impressive Gillie to curl a low shot past Brown. Waverley had late chances to claw back the deficit, but Luke Cooper fired wide with two golden opportunities. Instead, Euan Brown’s injury time tap-in to seal a comfortable win for Gordon and set up a quarter final with Stow. Gordon player/manager Livingstone said: “We could have made it easier for ourselves if we had taken our chances but I was happy that we kept trying to play football. Gordon: E. Turnbull, J. Milner (J. Bell 89), G. Gillie, G. Brown, E. Brown, N. Burrows, S. Anderson, G. Porter, K. Utterson, C. Livingstone, A. Brown. Hawick Waverley: K. Brown, D. Hope, J. Richardson, C. Dunne (A. Campbell 64), N. McConnell, R. Cairns, G. Ford (S. Clarkson 70), C. Hope, A. McFarlane, J. Yardley, L. Cooper.